Interests - reading, watching tv, disney films, High School Musical, dancing, drawing, music, arts and craft. 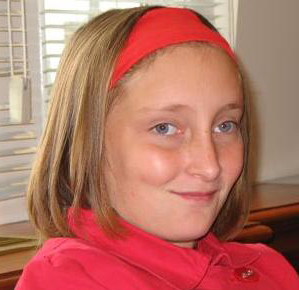 Jessica was diagnosed with an inoperable brain tumour on the 14th February 2003. Jessica then received three lots of chemo but unfortunately the tumour grew bigger so chemo was stopped. We then had a meeting with the neurosurgeon who said that any further treatment would probably be a waste of time, but I could not sit back and do nothing, so Jessica had six weeks of radiotherapy and as a result of this the tumour shrunk by 95%. I am so glad that we didn’t take his advice because we know that Jessica would no longer be with us if we had. Jessica’s prognosis is still uncertain but we still have her with us and we treasure everyday. Jessica has a lot of problems due to the tumour and the treatment received; her memory is very poor, she has concentration problems, tires easier, has poor balance and falls over quite a lot. Before she was ill she did disco, Latin American dancing and tap. She can no longer do these, but enjoys dancing indoors holding onto a chair or table or even a door frame. We can not imagine a life without Jessica. Post Pals has been fantastic and Jessica has really enjoyed getting all her post. I think it is now time to put her on the moving on page though as Jessica has remained well since she joined, although i will of course inform you if there are any changes to Jessica’s health, good or bad, although hopefully not bad. Thank you to all of the children’s elves this Christmas. The children all loved their presents and Nicole was really pleased with the NOW 68 and the charm making machine. Jack loved all his goodies, especially the hand warmer and the elastic band ball. Chris loved his socks. Thank you to everyone who sent the presents, we are very grateful to you all. I also want to say a big thank you to Sylvia for the tickets to see grease – Jessica and i really enjoyed the show, it was fantastic, thank you so much. Thank you to all the Post Pals team and to everyone who sent letters, cards and gifts. You are all very special. Jessica has had quite a good month with no more tummy pains, which have all settled down. We have an appointment to see the neurologist on Monday 10th to see what they are going to do about the high pressure and Jessica is quite worried about this. Jessica is now looking forward to Christmas and has written a list as long as your arm for what she would like. We wish everyone a happy Christmas and new year at post pals and to everybody who writes to Jessica, Nicole, Chris and Jack – they all really enjoy receiving post. Jessica hasn’t had a good month. She had to have a lumber puncture to test the pressure in her head and unfortunately it was high, so now we are waiting to see if she needs to have a shunt. On top of all that, Jessica is in hospital with suspected appendicitis. Thank you for the cards, emails and post this month. Jessica has had a good summer holiday. She is in Corfu at the moment and is due back on the 8th September. She has an appointment with the neurosurgeon on 12th September. Thank you to Eleanor for the book – Jessica has taken it to Corfu to write her diary in. Jessica’s scan results were good and there has been no change from last years. Jessica has been very unstable though for the last couple of months so the doctor is sending the images to the neurosurgeon to have a look at. He is wondering whether she is having periods of high pressure in her brain and this is causing her to fall over more and her memory is quite bad at the moment. I haven’t heard anything yet so hopefully nothing is wrong. Thank you once again for the cards and gifts – you are all very special people. Special thank you’s for the 2 bracelets Jessica received this month – one was a fairy and the other a handmade one. They were both beautiful. Also for the notelets from Israel – they are lovely and i think Jessica has used them already. Jessica has been well this month, although a little unsteady on her feet, but i think it’s the change of season. Jessica is having her MRI scan on tuesday 15th May. Many thanks to everyone who has written to Jessica. Jessica has had a good month and is looking forward to Easter and the holidays. Thank you to all who have written to her this month. Jessica has had a good couple of months; she really enjoyed her birthday party and got lots of presents. She went to the ice show in Brighton and really enjoyed that. Thank you to everyone who sent Jessica a card, present or email as she so enjoys receiving them. Thank you so much. Jessica has had a lovely Christmas. She has been well and is now looking forward to going back to school and at the moment is busy planning her 13th birthday party. Jessica says thank you for all her lovely Christmas presents, we were overwhelmed by the amount she received. Thank you to Kate for the big box full of things and it was nice of you to send a photo as well. Thank you to the elves, thank you to Judith (the headband is really nice, did you make it yourself?) and thank you to Julie. A big thank you to everyone who has sent a card or present, we think you are all really wonderful people. Jessica has had a good month and is now looking forward to Christmas. We have just heard that we have now got some funding to go towards a new wheelchair for Jessica and hopefully the chair will be here in the New Year. Jessica says Merry Christmas and a happy new year to every one who has taken the time to write to her, to send emails and sent little gifts. Jessica says thank you to Kate, Judith and Julie for their regular letters and pressies all through the year. Please don’t be offended if i have left anybody out! We would also like to say thank you to all the people who emailed and wrote due to the Martin Lewis website. Jessica has been a bit wobbly so far this month. I think it is a change in the weather, she doesn’t like the cold, her hands and feet turn blue. Jessica has received lots of emails this month and i saw that post pals has been posted on the martin lewis site, what a great idea. I am taking Jessica to the mayflower tonight, we are going to see the nutcracker as Jessica used to do ballet – she passed her first exam with honours. I am sure we will have a great time. Jessica has had a good month and we had a lovely holiday in Cornwall. Two weeks ago Jessica went to London to make a promotional video for over the wall gang camp. The other star was Vinnie Jones and she had a lovely day and Vinnie was very nice. Jessica has an appointment with her neurologist on Monday hopefully all will be well. Love to all who have written to Jessica and also thank you to those who have written to Chris, Nicole and Jack – they have really enjoyed getting post too! Special thank you to Kate for the card she sent Chris with the cars on. Jessica has been fine and we are going on holiday on Saturday to Cornwall so we are hoping that the weather gets a bit warmer. Jessica has been on holiday to Dorset with the over the wall gang camp. If any of you haven’t heard of them have a look at their website they are a wonderful charity they provide holidays for seriously ill children. Jessica has been 3 times now. I can’t believe the children are going back to school on Monday; the holidays have gone so quickly. Once again thank you for all the wonderful cards letters and presents. Jessica has started her new school and has settled in really well. She has been very well this month although the hot weather has made her very tired. She is enjoying her posty and says a big thank you to everyone who has written to her and sent a gift. Jessica has had a good month; her scan results were brilliant and there has been no change in the tumour mass. We also won our appeal to get Jessica into a special school and she starts on Monday. Thank you for all the gifts and cards, Jessica particularly liked the glass paints. Jessica has been quite well this month apart from a cold. She has got an appointment with her neurologist on Monday, so fingers and toes crossed everybody. Jessica would like to say thank you to Becky for her lovely cards and gifts. Also to Julie for her gifts and to Caroline for the beautiful bracelet. Thank you to Anna for the cat in the hat folder and the Garfield cartoons and thank you to Cherie for her letters from America. She has really enjoyed opening all of her letters, they really cheer her up. Thanks to everybody who has taken the time to write such lovely letters, they really do help.